Shopping online at US retailers and websites is a great way to get the latest goods and gadgets overseas, but shipping your products internationally can be expensive and confusing. What if the retailer requires a US address or doesn’t ship internationally? What if you are buying products from multiple US sources like Gap, Amazon and EBay and want to have everything arrive fast and at the same time? Ship2You solves all these problems by offering consumers who love shopping on American websites a simple, hassle-free way to receive their multiple online purchases in one shipment at a significantly discounted rate, compared to shipping each package individually. This Ship2You service is called consolidation, and it’s available to all Ship2You customers. 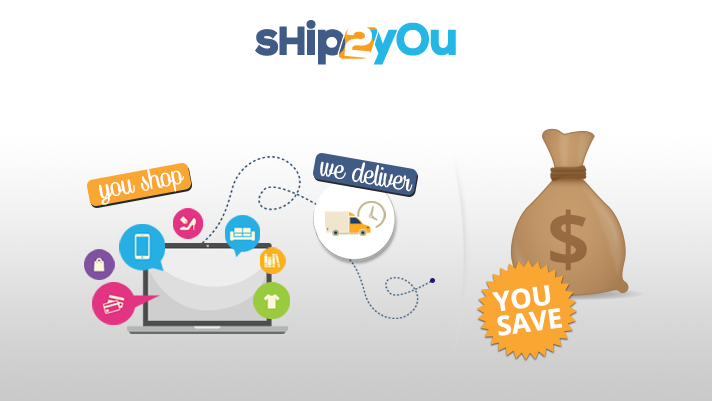 Learn more about how Ship2You can save you time and money with consolidation today! If you are a new customer, joining Ship2You is free and takes less than a minute to sign-up. Once the sign-up process is complete, you are given a dedicated address and suite number in the US, so you can start shopping and using your US address immediately. All customers of Ship2You have access to a personal dashboard on the Ship2You website optimised for use with a mobile, computer or tablet. There’s no app or program to download and customers can manage, ship and track their purchases from the comfort of their own home. Customers can also save payment options and preferences securely on their dashboard to make future shipments with ease. Once you are a member, you can shop on virtually any website in the US using your dedicated US address as the destination for your packages before they ultimately arrive at your door. Just shop, enter your US address at checkout and the packages will be delivered to our safe and secure warehouse where they are shipped directly to you at huge savings. For example, you can buy a handbag at Bloomingdales, a mobile phone from EBay and a pair of shoes from Amazon. Upon checkout on each of the three retailers’ websites, you simply enter your Ship2You US address and, as soon as we receive all three packages in our warehouse, we ship the items directly to you in one package. Individually, these items cost nearly $40 each to ship -that’s $120 in shipping costs alone. With Ship2You’s consolidation service, the cost of shipping is dramatically reduced to $40, just a third of the cost. In another instance, say you bought three laptops – all from Newegg, and one suit from Macy’s. At checkout you just enter your US address and have all the items shipped to our warehouse. Once all the packages arrive, our trained professionals will then consolidate and pack your three laptops along with the suit safely and securely before shipping everything in one box straight to you. Shipping for each of the four items would cost over $400 if shipped separately, but by utilising Ship2You’s consolidation service, the cost of shipping is slashed to just $150. Once your items reach our warehouse, you will receive an email to notify you that each of the packages have arrived. From the time that each package arrives, you have thirty (30) days of free storage. This is beneficial because your packages may not all arrive in our warehouse at the same time, so this gives you the opportunity to wait for all your packages to arrive and then consolidate all the packages into one convenient shipment. With consolidation, you can shop and purchase multiple items in the US and have everything sent to you in one shipment in a safe and secure manner. When your items reach our warehouse, we can take a picture the outer box and its contents and send it directly to you via email so you can double check to ensure have received the correct item in the condition described from the retailer before we ship it to you. This can help you avoid costly returns and make sure you receive the product you ordered in the first place. Once all your packages arrive in our warehouse, consolidation with Ship2You allows you several options to ensure you get the best possible international shipping rates when combining your packages into one shipment. Option 1: Combine shipments by keeping the outer boxes and retail packaging of all items – this works great with televisions and other fragile items. Option 2: Combine shipments by removing the outer box, but keeping the retail packaging of each item – this is a good option with handbags and more expensive clothing options. Option 3: Combine shipments by removing all outer boxes and retail packaging – this works great for shoes and other items that have bulky, unnecessary retail packaging. Option 4: Customise any shipment – just tell us what you require and we will make it happen. According to your preference, send your shipment from the US directly to your doorstep, usually within 2-5 days. As a bonus for all Ship2You customers, we are offering a 10% discount on your next shipment with our loyalty discount. Simply sign-up and go to your dashboard to share a 10% discount code with at least one friend via social media or email and receive your exclusive 10% discount code. To take advantage of offers from American retailers, ship direct from the US to your doorstep using Ship2You. Save even more money by utilising Ship2You’s consolidation service to combine all of your US purchases together in one convenient shipment. With free membership, free storage for thirty days and free savings on shipping (our customers usually save an average of 50% or better); start using Ship2You as your international shipping partner. Join now and save big with consolidation when you ship from US or china! are taxes included in the shipping price? If not do u have a list of taxes applied in Lebanon? We don’t charge for the customs. DHL pays the customs on your behalf and will charge you upon delivery. Since customs varies in Lebanon, that’s why we can’t give you any figure for that.